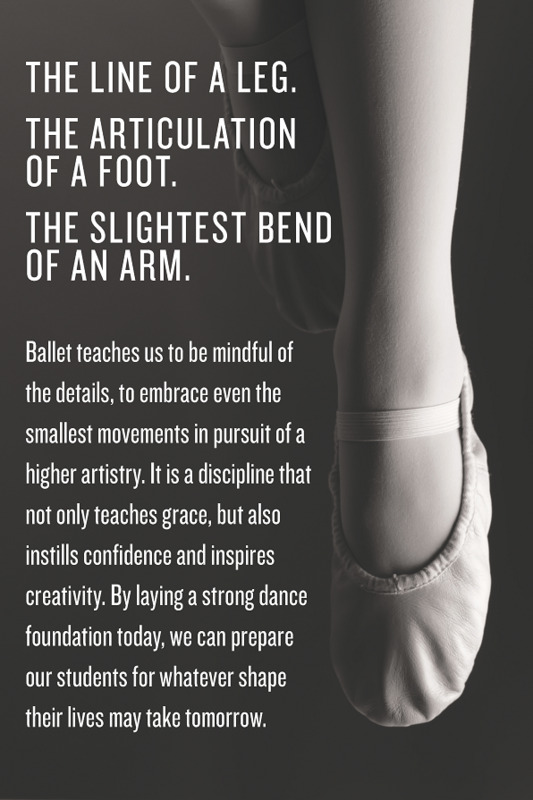 Ballet Spartanburg’s Center for Dance Education core principals are commitment, repetition, and hard work. In every aspect of life, whether it is dancing, academics, musical interests, or sports, in order for today’s youth to reach a goal, they must learn to reach beyond their limits. The intrinsic values of self-discipline and hard work are the underpinnings of success in life. Our dance pedagogy program emphasizes an excellent teaching philosophy. We instruct with the highest degree of integrity to enrich the human spirit through dance by instilling self-confidence, grace, and imagination. The Center for Dance Education is an instructional center committed to providing the highest quality dance education in a non-competitive atmosphere. Our mission at the CDFE is a collective effort to create a pleasant and supportive atmosphere for artistic excellence to thrive. With over 24 years of excellence in teaching at The Center for Dance Education, a professional knowledge of ballet technique, and a professional background of performance with a national ballet company, Miss Lona holds a breadth of knowledge of ballet which is incomparable. The Center for Dance Education has two separate divisions: The Recreational Divison and The Advanced Ballet Division. Each is intended to challenge students and support their physical, mental, artistic and emotional development consistent within their Division Level. The Recreational Division offers high quality dance instruction in the diverse genres with flexible scheduling, focusing on personal enrichment and pure love of movement. The Advanced Division offers a curriculum focusing on building strength, stamina and flexibility throughout. Both divisions instill confidence, imagination and focus. Students who graduated from the Advanced Division have held positions at the National Ballet of Canada, Grand Rapids Ballet, Minnesota Ballet, Orlando Ballet, Ballet San Antonio, Radio City Rockettes and have studied at national ballet schools such as American Ballet Theatre, Boston Ballet and Harid Conservatory. Our students' journey through the Center for Dance Education not only encompasses dance education but the realization that the values of dedication and hard work are the underpinnings of success in higher learning education. If you are interested in a dance class or dance level for your child, contact Miss Lona at lgomez@spartanarts.org.